Rev – wanna eat burgers with some new people with me? OF COURSE I WANT TO EAT BURGERS!!!! Is that a trick question? No, it’s just Adam being polite, a character trait that Adam is well known for. 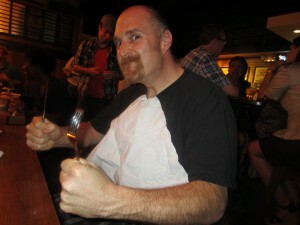 Even though Adam’s Bacon exploits are well known, he definitely carries the Burger torch. 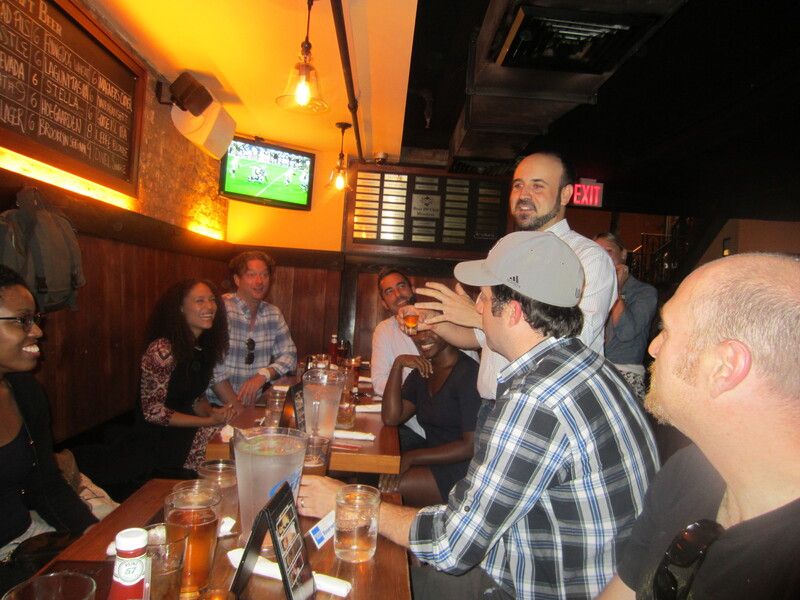 I knew I had met a crew of Burger lovers who shared a similar passion to mine with John from “The Hoboken Chapter of the Burger Club” replied with an invite to join them at their regularly scheduled meeting. 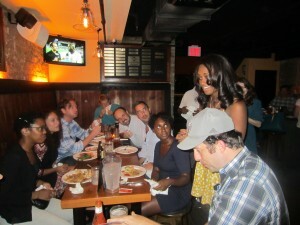 The next one was to happen at Amity Hall in New York’s Greenwich Village. I had not had the pleasure of dining on their stuffed Burgers since National Hamburger Month in 2011. They were serious, seriously AWESOME!!! 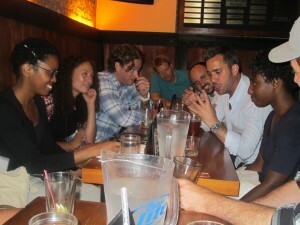 The camaraderie in this Burger club is of regal nature. Their ties to each other are some through history, school, friends and some, some of them are just in the club because they love Burgers. Proving my love is something I feel like I do every day with this Burger blog, but that didn’t matter here. Once you walk into this room, we are all equals and nothing is more important than the almighty Burger. 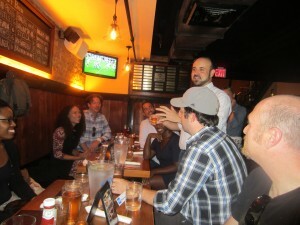 Each new recruit stood up, made their speech and were welcomed to the family by being given their Burger name by one of the club’s leaders, Omar. 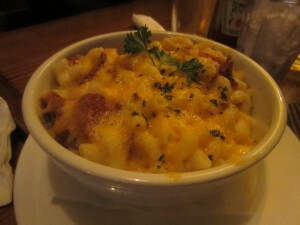 Adam ordered a a bowl of Amity Hall’s Mac N Cheee, WITH APPLEWOOD SMOKED BACON. It was damn good and got the salivary glands fired up. 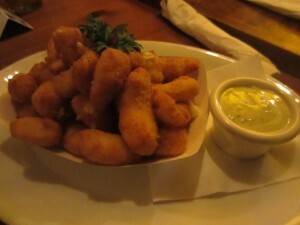 I asked for a bowl of Amity Hall’s Wisconsin White Cheddar Curds with Avocado Ranch Dip. If you’ve never had a Cheese Curd, you are missing out. Where I come from in Michigan, home to the Pinconning Cheese Store, we call it “Squeaky Cheese.” These are the base parts of soured Milk that are made into the Cheese we all regularly enjoy. They are generally mild flavored and intended to be eaten shortly after they are made. One way to preserve their flavor is to deep fry them. We don’t do that much in Michigan so I was psyched to have some of these. Damn, they were great and I would even argue better than a fried Mozzarella Stick. How was the Burger? 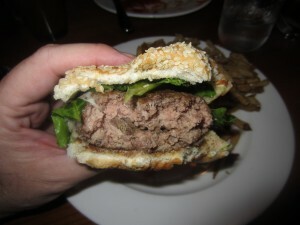 Well, you can read my original review of Amity Hall’s stuffed Burgers here. 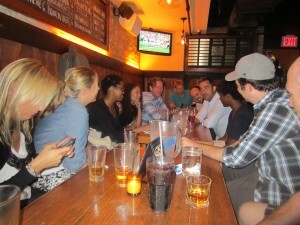 But the way the club works, post Burger, we all review together. A tally is taken and then the number is averaged out. 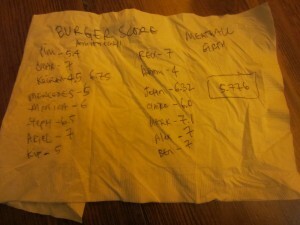 After much and I mean a lot of, deliberation, with commentary from each Burger Club member, the votes were on. The math was run, mostly with greasy fingers on a smart phone and a verdict was reached. 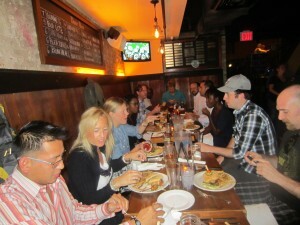 I had a fantastic time with the Burger Club and look forward to our next exploits. If you want to become a member, drop me a note and tell me why. I will be sure to forward it onto the Burger Club members. The Hamburger is the ultimate American comfort food. It symbolizes comfort, safety, warmth, home, freedom, faith, love, companionship and all that’s right in the world. A Hamburger not only cures hunger pangs but it can also cure the blues. It’s a symbol of America, a symbol of progress, commerce, business and pride. This nation and the billions of dollars behind it, have, in part, been made on the one sandwich with the most exciting universal appeal. A Burger is recession proof. It can survive the deepest of depression as well as be served as the height of society. You can eat them for any meal or use them to mark any occasion. It’s appeal is egalitarian. A Burger will never go out of fashion and Chefs as well as Moms, Dads and anyone else will never stop finding new and creative ways to prepare them. A Burger can have all 4 food groups and as a single item, still encompass an entire meal. 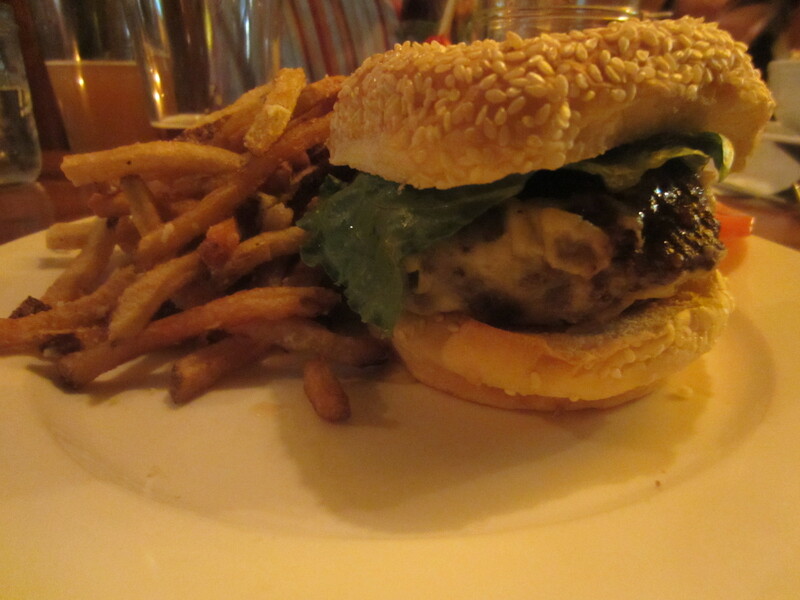 To me, a Burger represents all that is good in the world and stands as a symbol of all that’s important in life. The patty itself, that’s your foundation. All of your hopes, dreams and passions are in that Beef. It’s what ties all of life together and creates the basis for everything else. The toppings, well those are accomplishments, achievements and all the good things that happen to you in life. If you never stop trying, you’ll never run out of toppings. Lastly, there’s the Bun and while sometimes that may seem like the least exciting part of the Sandwich, it’s the most important and most overlooked part. Without that Bun, you don’t have a Burger, you have a Salad or a covered Ground Steak. It’s that toasted piece of Bread that turns it into a Burger by cradling and supporting all the life inside. The Bun is your family. It’s your friends. It’s all the things in life that we have a tendency to overlook because it’s always there. Sometimes we forget to give those people and their Buns the credit they deserve for holding us and making sure we are surrounded with support and love. A Hamburger is the ultimate comfort food. It reminds us to keep our loved ones close to us and in mind, while it encourages us to try harder, bring out the best of what’s inside and to make our dreams come true. It is the American dream, it is your family, it is your dreams, it is a symbol of the strength inside you. The Hamburger is a shining beacon of hope, truth and love. Eat a Hamburger today and tomorrow you’ll build a better world. This entry was posted in Bar, Beer, Burgers, Event, Hamburgers, New York, TV and tagged "squeaky cheese", adam poch, amity hall, best burger nyc, burger club, burger conquest, cheese, ciancio, curds, french fries, hamburger, hoboken burger club, new york, ny, nyc, rev, review, stuffed burgers, the rev meter for social community. Bookmark the permalink.